Three tails. Dark gray wings with streamlined, dark mahogany bodies. 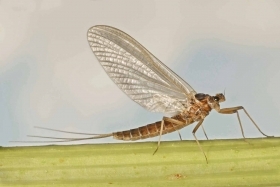 The most important emergence occurs in late August through early October. 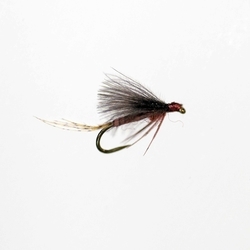 Duns emerge during mid morning while spinners fall in the later afternoon to early evening hours. Slow to medium fast gravel bottom water. Mahogany Duns are common on the Harriman Park stretch of the Henry’s Fork, the South Fork of the Snake and several other local waters. 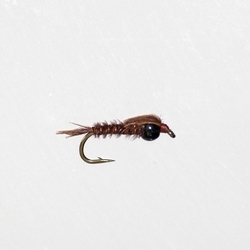 The Mahogany Duns provide some of the finest dry fly fishing of the late summer on the Harriman Park and other waters. They are classified as crawler nymphs. There are a number of other species that emerge throughout the summer but the late season is the best. Emergence takes place at the surface making an emerging nymph pattern very effective when trout are rising.